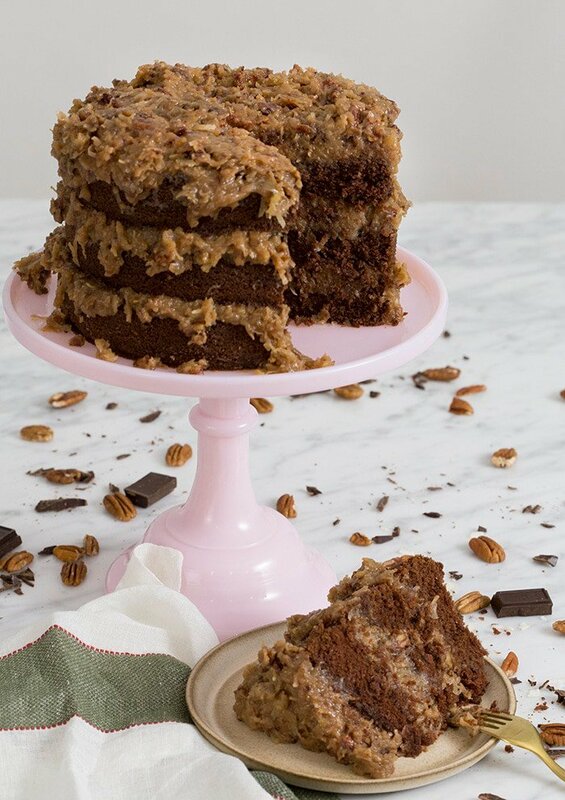 This rich and tender German chocolate cake is slathered in a coconut pecan caramel frosting that’s beyond addictive and totally delicious! German chocolate cake is named after Samuel German, the inventor of a type of dark chocolate (not the country). It’s also one of my favorites! Once you make the icing, you’ll be adding it to cupcakes and ice cream in no time! Enjoy. 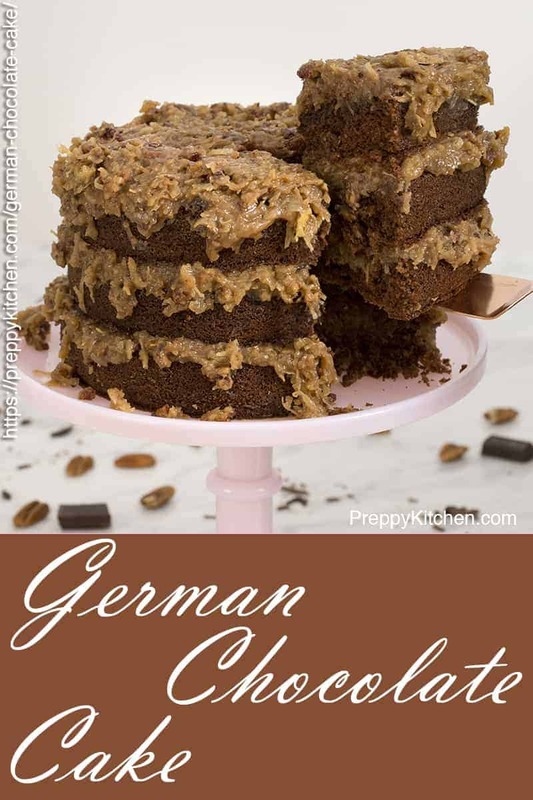 What Makes German Chocolate Cake Different? 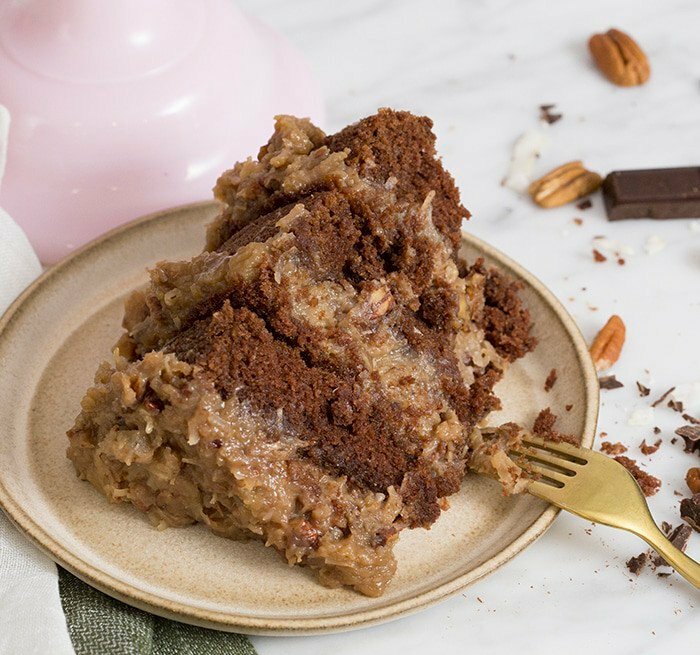 German chocolate cake has a lighter chocolate taste, a delicate, tender crumb, and of course lots of that amazing coconut pecan frosting. Whip those egg whites up last and lighten the batter by whisking in 1/4 of that fluff into the batter before folding in the rest. If you’re out of buttermilk try adding two tablespoons of lemon juice or white vinegar to whole milk. Stir and set aside a few minutes to curdle. The frosting is traditionally made with pecans but you can use walnuts or even chopped macadamias if preferred. Should German Chocolate Cake be refrigerated? You can leave this cake out overnight if covered but it’s best to refrigerate if storing for any time longer than that. Let your cake come to room temperature before serving for optimum enjoyability. How do you make German chocolate frosting? First, you’ll want to toast the pecans at 350 degrees for about 8-10 minutes. Combine the sugar, milk, egg yolks, and salt in a saucepan over medium heat until the mixture thickens. Lastly, give those toasted pecans a rough chop and stir them into the mixture with the coconut. Delicious! You will add this cake into your regular baking rotation, it’s that delicious. ALSO I doubled the frosting for this cake because I’m need copious amounts of that coconut pecan frosting in my life. 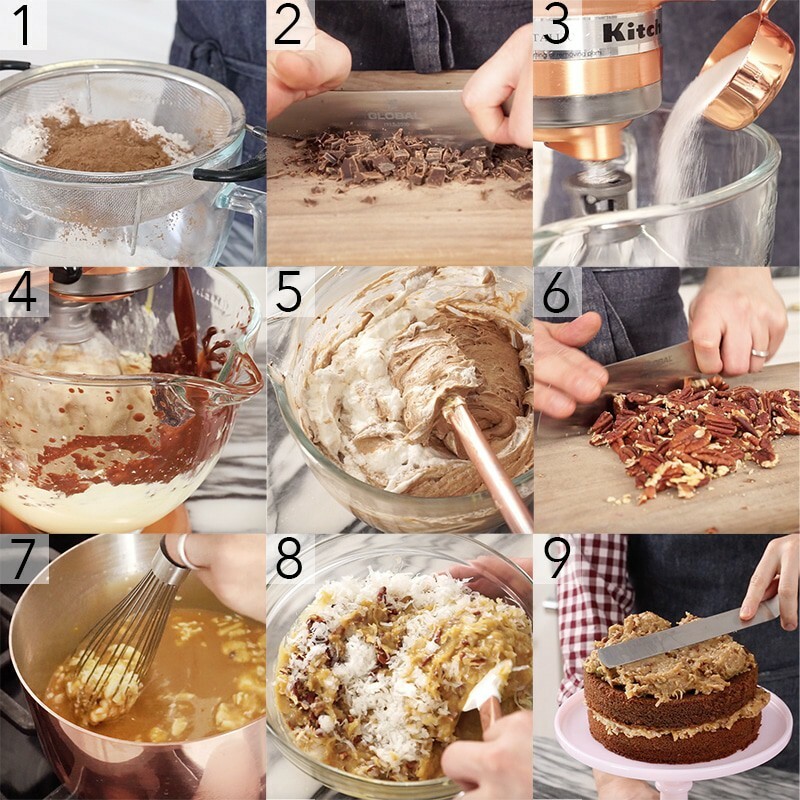 How Do You Make A German Chocolate Cake? For the cake; Preheat the oven to 350 degrees F. Sift the flour, cocoa powder, baking powder, baking soda and salt into a medium bowl and set aside. Lightly butter, flour and line the bottoms of three 8 x 2 inch pans with parchment paper. Chop up the chocolate and melt it with the coffee in a glass bowl over a pot of simmering water. Make sure the water doesn’t touch the bowl. In the bowl of a stand mixer, or with a hand mixer, beat the butter until it is smooth and creamy. Add the sugar to the stand mixer with the creamed butter and continue beating until it is fluffy. About 3-5 minutes. Scrape down the sides of the bowl as needed and add the egg yolks one at a time. Make sure each egg fully incorporates before adding the next, then add the vanilla. Add the melted chocolate. Beat until it is fully incorporated, then add the flour mixture and buttermilk in three additions, beginning and ending with the flour mixture. Beat only until the ingredients are mixed together. Beat the egg whites in a separate bowl at high speed until soft peaks form, then fold it into the batter. Divide the batter evenly among the three prepared pans and smooth the tops. Bake for about 30-35 minutes or until a toothpick inserted in the center comes out clean. (Rotate the pans about halfway through to ensure even baking). Remove from the oven and let cool for about 15 minutes. For the frosting; preheat the oven to 350 degrees F. Place the pecans on a baking sheet and bake for about 8-10 minutes or until lightly browned. Remove them from the oven, let cool, and then give them a fairly fine chop. In a medium saucepan, combine the sugar, milk, egg yolks, butter and salt. Cook over medium heat, stirring constantly. When the mixture begins to boil and thicken (about 5 minutes), remove it from the heat. Pour the mixture into a bowl and stir in the chopped pecans, coconut and vanilla extract. Give it a good mix to make sure everything is well incorporated, then let it cool until it is spreadable. (About 30-60 minutes). To assemble this cake; place one layer on top of the other, spreading one third of the frosting in-between each layer until you end up with the last layer of frosting on the very top of the cake. (The sides of the cake are left bare). Enjoy! 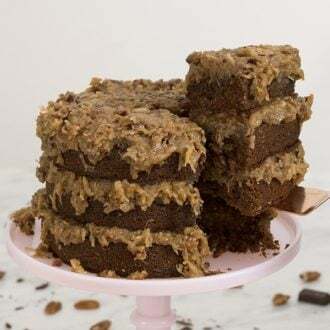 If you’ve tried this German chocolate cake then don’t forget to rate the recipe and let me know how you got on in the comments below, I love hearing from you! This classic dessert features a rich and tender chocolate cake slathered in a coconut pecan caramel frosting that's beyond addictive and totally delicious! Preheat oven to 350 degrees F (180 degrees C) and place oven racks in the upper and lower third of the oven. Lightly butter and flour, and line the bottoms of three - 8 x 2 inch deep round baking pans with parchment paper. Sift the flour, cocoa powder, baking powder, baking soda, and salt into a medium bowl. Melt the chopped chocolate and coffee in a glass bowl over a pot of simmering water. Make sure the water doesn't touch the bowl. In the bowl of your stand mixer, or with a hand mixer, beat the butter until smooth and creamy. Add the sugar and continue beating until the mixture is fluffy (this will take about three to five minutes). Scrape down the sides of the bowl as needed. Add the eggs yolks, one at a time, mixing well after each addition. Add the vanilla extract and beat to combine. Then add the melted chocolate and beat until incorporated. Add the flour mixture and butter milk in three additions, beginning and ending with the flour mixture. Beat only until the ingredients are mixed together. Beat the egg whites in a separate bowl at high speed until soft peaks form. Fold into the batter. Divide the batter evenly among the three prepared pans and smooth the tops. Bake for about 30 - 35 minutes or until a toothpick inserted in the center comes out clean and the tops spring back when lightly pressed. Rotate the pans about halfway through baking to ensure even baking. Remove from oven and place on a wire rack to cool for about 15 minutes. Butter or lightly spray with a non stick vegetable spray a wire rack before inverting the cakes onto the rack to prevent the cakes from sticking. Cool the cakes completely before frosting. Preheat the oven to 350 degrees F (180 degrees C). Place the pecans on a baking sheet and bake for about 8-10 minutes or until lightly browned and fragrant. Remove from oven, cool, and then chop fairly fine. If you're out of buttermilk try adding two tablespoons of lemon juice or white vinegar to whole milk. Stir and set aside a few minutes to curdle. DOUBLE the frosting for an even more decadent cake. You won't be sorry! This cake is a true classic. 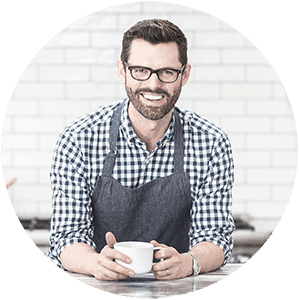 Love the way you incorporate real ingredients! I made this earlier this week for my husband’s birthday. Very good — decadent tasting. I made 2 layers only. Great recipe! Where is the video though? Filmed and editing, will be up soon!